Dibaabish Jaboo kneads the pale, vegetative flesh of the enset plant, like her mother did, like her granddaughters do. When she’s finished, she bundles the plant’s thick, decomposing stalk into its 12-foot-long leaves along with spices and agents to help it ferment for a few weeks. Once it’s ready, she can store the bundle underground, or pound it into flour for bread or porridge. 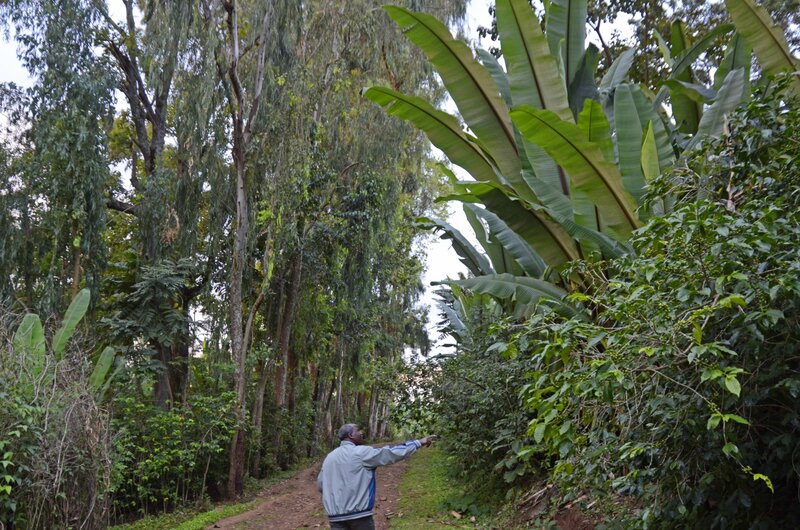 Here, in southern Ethiopia, enset thrives on farms that could be mistaken for forests—growing among coffee trees, sugar cane, gargantuan squash, corn, yam and other crops—where its long-lasting roots shield the soil from erosion by keeping dirt in place during droughts and floods. 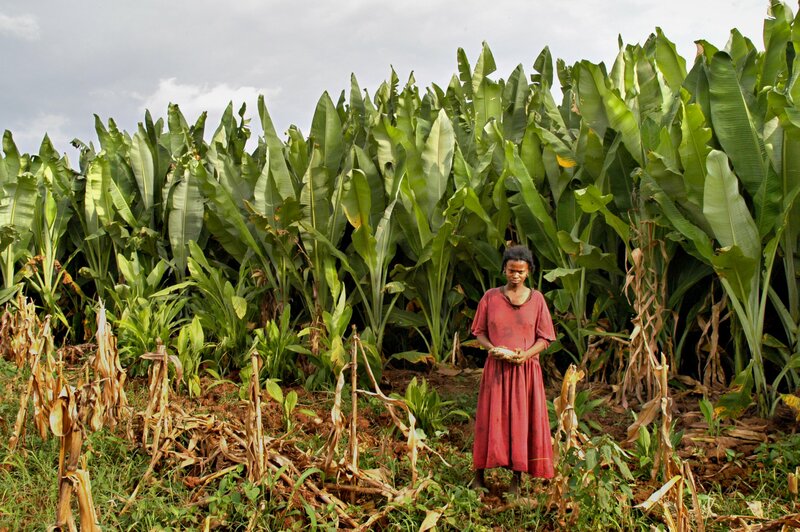 Ethiopians have cultivated the perennial plant—a cousin of the banana tree—for thousands of years, converting its stalk, roots and leaves into food, medicine, decoration and more. It has persisted through droughts over centuries, storing water in its bulbous stalk, as camels do in their humps. When a Portuguese priest came to Ethiopia in 1640, he described enset as a “tree against hunger” because of its resilience and long shelf-life as a fermented food during famines. Even when other crops fail, enset often remains. 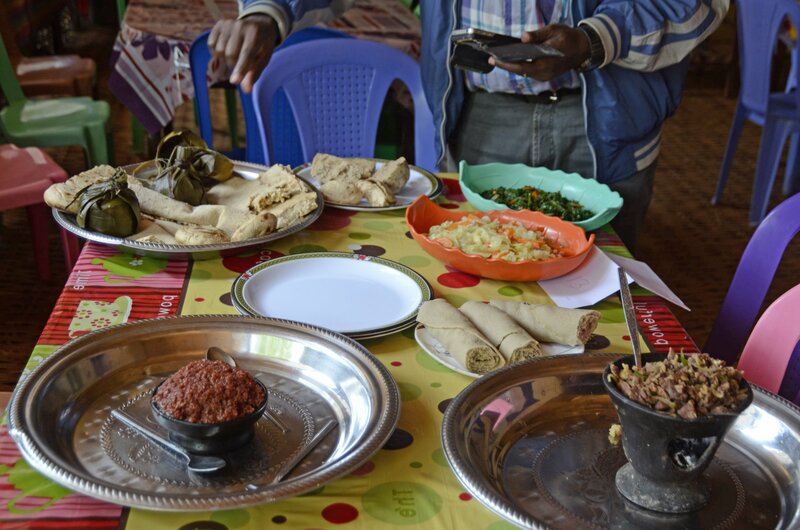 Tadesse Kippie, an agroecologist at Dilla University, and I eat the decomposed plant, baked into a round, dense bread called kocho, and served with flavorful tidbits of beef. Kippie grew up with enset—“After mother’s milk, enset was my first food,” he recalls—and is one of many enset enthusiasts in Ethiopia, where it is experiencing something of a revival among agroecologists. They’ve explored the nutritional content of its fermented products, and shown, for example, that pregnant women with enset-based diets have higher levels of vitamin B-12 and zinc, which protect against some pregnancy complications, as opposed to women who ate corn as a staple instead. They point out that enset can be safely stored without refrigeration for a year or more, and that coffee trees fare better when grown in the shade of the plant’s leaves. 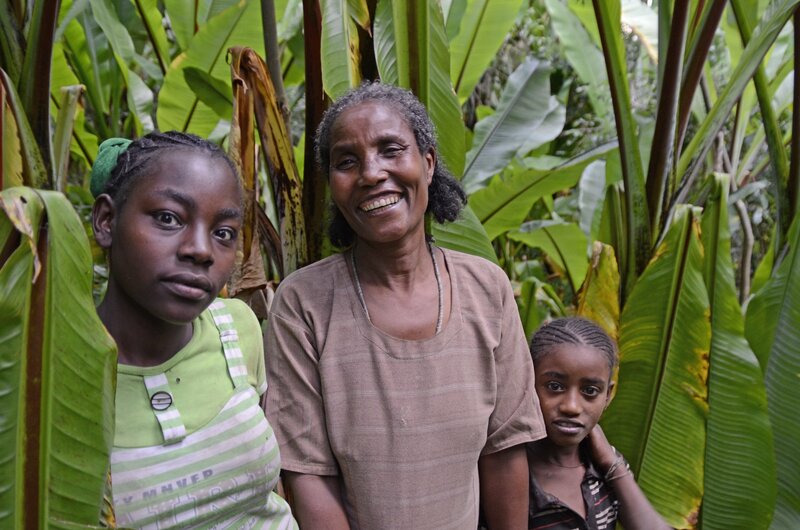 Subsistence farmers like Jaboo know from generations of experience to plant enset alongside a diverse range of crops that provide different nutrients, and that can occasionally be sold at the market. And they’ve noticed that the soil is richer with enset or legumes mixed in. Most importantly, this crop diversity lessens their risk of starvation because if one crop fails, they have another to lean on. They have little room for error because most subsistence farmers in Africa do not have extra money with which to buy food. If they don’t grow it, they oftendon’t eat it. What’s more, tough times lie ahead for small farmers in sub-Saharan Africa: Climatologists predict that droughts and floods will grow more frequent and severe, especially in tropical and sub-tropical nations. That’s dire news for 80 percent of farmers in sub-Saharan Africa, who depend on farms no bigger than a couple of hectares (about the size of two baseball diamonds), and who live on less than $2 per day. If climate change continues unabated, and population growth rates remain the same, 355 million people are predicted to be undernourished in sub-Saharan Africa by 2050. In the 1960s, India confronted food shortages by boosting the output of farms through industrialization. Rather than focus on small, diverse plots, the government and farmers converted the land to large swaths of singly grown, high yield cash-crops in what became known as the “Green Revolution.” These monocultures were then maintained with irrigation, synthetic fertilizers, pesticides, and sometimes tractors and other machinery. On the whole, sub-Saharan Africa has yet to benefit from these technologies, which is why the average African farmer produces half the cereal an Indian farmer does per hectare, less than a fourth of a Chinese farmer, and less than a fifth of an American farmer. Now, the main strategy put forward by the Ethiopian government and the organizations and governments that partner with them is to feed the masses at risk of starvation by boosting the productivity of African farms. For example, in 2012, President Obama launched the G8 New Alliance for Food Security, which partners African governments with American and European agencies, and local and international agriculture companies to foster investments that will lead to the distribution of high-yield soybean, corn, chickpea, banana, and coffee crops. A division of the New Alliance that focuses on smallholder farmers is called the “Feed the Future” program. Through this program, 15,000 Ethiopian farmers converted to “income-generating” corn varieties over the past few years, and increased their average yields. Last year, these farmers sold more than 30,000 metric tons of corn to the U.N. World Food Programme, which then redistributes the grain to those in need via various aid programs. Many maintain that classic Green Revolution strategies to increase productivity through high-yielding monocultures are the best solutions to food security. Yet agroecologists like Kippie are quick to point out less favorable results of the revolution, such as the loss of biodiversity, soil erosion and a spike in fossil fuels required to operate machinery—which escalates the climate change now threatening small farmers in Africa today. In other countries, monocultures have quickly led to problems in the past. For example, in the 1970s in the U.S., a single disease, southern leaf blight, wiped out 50 percent of the country’s commercial corn yields, worth almost $1 billion (over $6 billion in today’s dollars). Because commercial corn was so genetically uniform, its susceptibility to the disease was ruinous. The catastrophe was only averted once an African corn variety was discovered to be resistant to the blight, and was bred with commercial crops—creating more genetic diversity in corn crops. It’s also no guarantee that the transition to high-yielding monoculture will bring all subsistence farmers out of poverty. And if a disease like southern leaf blight struck, those still living day-to-day would have neither the financial resources to tide them through the disaster, nor backup crops to rely on. In the case of enset-growers in southern Ethiopia, they would no longer have the age-old plant stored safely underground. For these reasons, Kippie and others argue that subsistence farmers may be better served by incremental improvements to their traditional way of life. “People have to be self-sufficient because you can’t trust that their interests will be kept in mind as the country modernizes,” he says. If diversity is the key to small farmers’ survival, the question becomes how to make their native way of life economically viable. Researchers suggest the solution is to better integrate native crops into the market—that way they could garner a profit on top of feeding families. That approach has been somewhat successful with another Ethiopian crop, the grain teff, which is used to make injera, the sour, thin pancake that’s generally topped with stews, and commonly served in Ethiopian restaurants worldwide. The grain is now exported to Europe, marketed as a gluten-free bread alternative. If sales of enset were to increase, heightened production would follow. Another avenue of research focuses on how to improve the yield and robustness of native crops. In 2009, an Ethiopian researcher, Gebisa Ejeta, won the World Food Prize for his development of hybrid varieties of sorghum that were resilient against drought. And currently, scientists with the International Institute of Tropical Agriculture, a research organization focused on hunger and poverty, are evaluating natural and genetically modified varieties of enset that would withstand a blight of enset and banana called bacterial wilt. Meanwhile, Kippie offers non-tech solutions: greater access to indigenous crops. He has applied to lease land from the government so that he can cultivate enset and sell the young plants to smallholder farmers at a low price. Already, he facilitates the donation of hundreds of small enset plants to widows like Jaboo, using money from the Christensen Fund, a San Francisco–based foundation that offers grants in support of indigenous peoples. If Ethiopia manages to maintain its native biodiversity, while increasing its gross domestic product, it could serve as an example for other African nations to follow. It has one of the fastest-growing economies in Africa, but in this transitional period, it would seem foolish to dump a plant that may have saved civilizations from collapse in the past. Travel for this story was paid for by a grant from the Pulitzer Center on Crisis Reporting in Washington, D.C.